Paddling across Paradox Lake in the Adirondack Mountains. What a difference 150 miles can make. We entered the Adirondack Park and the leaves went from green and brown to vivid red, orange and yellow. As we traveled up the northway towards our destination the sights continued to amaze our eyes. 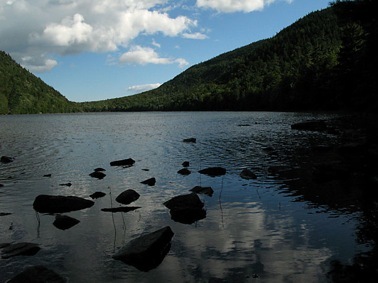 Once we arrived at Paradox Lake, almost 900 acres, we checked out the water and then began to set up camp. The weather was stellar, sun, light winds and beautiful crystal clear nights. This allowed us to spot numerous falling stars on Saturday night. On Sunday we paddled around the lake, stopping on one of the island to heat up some soup and down a sandwich. The water was cool and clear. The mountains rose up toward the sky as we paddled west from out campsite. We sat around our campfire by night and gazed into the dancing flames and glowing coals, thinking how lucky we are to experience such wonderful days. If you had a day off, without any commitments, what would you do? Where would you go? I have passed along our thoughts, now we want to hear from you. The sun sets in the western sky, illuminating the Catskill Mountains. There is a quiet hush that I feel when I see the sun rising or setting. It is emotional. A beginning, a closing, marking time? I hope not. I like to think of it as a celebration. Seeing the sun illuminating the landscape with soft colorful light makes me feel alive. It refreshes and relaxes me. It makes me contemplate life. It makes me realize how small I am in the world. As I stare in amazement toward the light, it blinds me at times, changes my vision after being captivated by its rays. I think about what I have in life. I think about what I am losing as my dad fades by the disease that has ripped his body from his mind. He is fighting a losing battle with ALS. I have grown up on the Hudson with my dad and my grandfather and then later, shared the river with my daughters. I have watched the sun rise over the source of the Hudson, Lake Tear of the Clouds, and have watched it set near the sea, in Manhattan. From paddling with Edie on crisp September mornings to watching the light fade behind her kayak as we head back to Rhinecliff on a summer evening, every one of them has a special memory associated with it. We should cherish and share them with the ones we love. The blue boat on the dock at Buck Pond State Park. What more could you ask for? 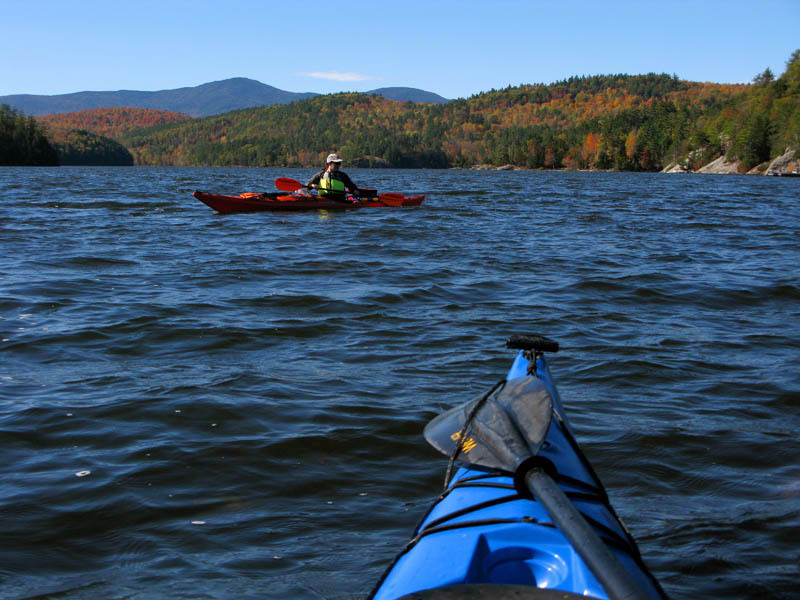 The Adirondack Park has some of the most incredible peaks and lakes on the east coast. They are not the biggest, but there is a lot to enjoy. And the great thing, they are so close to us. And, on this trip Edie, Sam and I got to kick back and relax as we set up camp at Buck Pond over the long weekend. I have been going north to camp my whole life. My dad took me and my brothers to the Adirondacks ever since we were big enough to walk. We would go up for a week each summer, sometimes even longer. And, as I visited with my dad this evening, we chatted about some of our trips up to the north country. Hiking in the mountains, swimming and canoeing in the lakes and um.. the hide-be-hinds. You don’t know about the hide-be-hinds? Well, they were my dad’s way of making sure three boys were frightened enough of the shadows in the trees to stay close to camp as the sunlight fades and the flickering flames of the campfire illuminates the woods. Apparently, these beasts hid behind the trees waiting for unsuspecting children to fall prey. This translated to some pretty scary trips to and from the bathroom in the campsite. After 40 some years, I think I may be finally getting over the night beasts. I do have to admit, we never wandered too far into the night woods. Our trip lacked any of these beasts. But we did spot loons in the lake, heard eagles and owls in the woods and caught the spectacular stars in the northern skies. How relaxing. I for one will remember.. its just a short drive. We are going back soon. Sunrise paddle in Bolton Landing, Adirondack Park. What did you do over your Memorial Day holiday? Burgers, hot dogs, friends and family? We did a little of everything, a trip to the Adirondacks with friends, local paddling with family, parades. Memorial Day paddle in a quiet cove. It’s really nice to share time in the outdoors. It is relaxing and rewarding. Good for both the mind and body. When paddling over to the island to camp, we navigated through large waves because of boat traffic, but once we reached our spot, it was smooth water paddling. Spending a night on the island was very peaceful. Where did you paddle? If you would like, email a photo into us and we can post it on the blog and share it with the paddling community. A quiet morning in Bolton Landing, Adirondack Park. If you are ready to explore the water, let us know, we can help get you there.